my take: Finally! A Pride & Prejudice inspired novel that is great. If you love P&P and you enjoyed Downton Abbey (or long ago Upstairs, Downstairs), this is a read for you. Also, if you loved the A&E version of P&P, and you can mentally hear Mrs. Bennet yelling for "Hill" ... now you can read the story of Mrs. Hill. From the servants' areas we can hear Mary playing the piano (achingly poorly) and Lydia and Kitty arguing over ribbons and bonnets and trouncing around the house. As Sarah fixes their hair and helps dress them, we get some intimate moments with Jane and Lizzy. And every so often we get to encounter Mr. Darcy. Sigh. In addition to spying our favorite Bennet family members, we learn of the hard work it takes to launder their petticoats, feed them, get their letters to the post, shuttle them to dances, and the extra work caused by visitors such as Mr. Collins and Mrs. Bennet's nephews and nieces. The middle section of the book goes back in time to Mrs. Hill's earlier life and James Smith's experience in the Spanish War - adding some historical perspective to our beloved Jane's era. 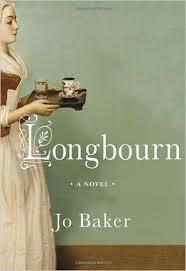 Ms. Baker weaves in a intriguing tale off the estate, and then returns us to Longbourn to see how it all plays out. By the end of the novel, we experience a bit of the empty nest that Mr. and Mrs. Bennet arrive at after three daughters are married. And a well-deserved rest for Mrs. Hill. my source: Daughter Anne had read and I spied it in the used section at Schuler's ... hardcover for cheap! Available for loan. my verdict: Well-done P&P spin off. I loved it. I loved this one! Such an interesting look at the other parts of the historical P&P world that Jane Austen doesn't show us.